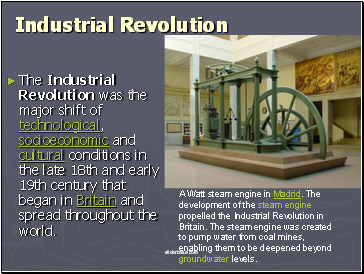 The Industrial Revolution was the major shift of technological, socioeconomic and cultural conditions in the late 18th and early 19th century that began in Britain and spread throughout the world. A Watt steam engine in Madrid. The development of the steam engine propelled the Industrial Revolution in Britain. The steam engine was created to pump water from coal mines, enabling them to be deepened beyond groundwater levels. The effects spread throughout Western Europe and North America during the 19th century, eventually affecting most of the world. During that time, an economy based on manual labor was replaced by one dominated by industry and the manufacture of machinery. 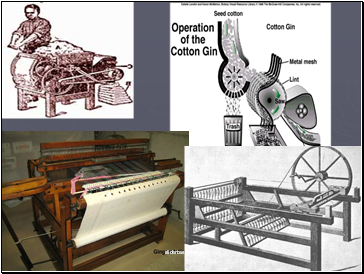 The first major technological innovation was the cotton gin. 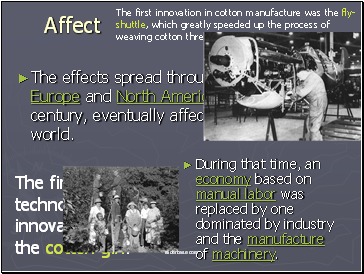 The first innovation in cotton manufacture was the fly-shuttle, which greatly speeded up the process of weaving cotton threads into cloth. 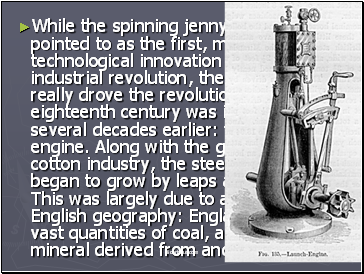 While the spinning jenny is frequently pointed to as the first, major technological innovation of the industrial revolution, the invention that really drove the revolution in the eighteenth century was invented several decades earlier: the steam engine. Along with the growth in the cotton industry, the steel industry began to grow by leaps and bounds. This was largely due to a quirk in English geography: England sits on vast quantities of coal, a carbon based mineral derived from ancient life forms. Coal burns better and more efficiently than wood and, if you have lots of coal, its infinitely cheaper. 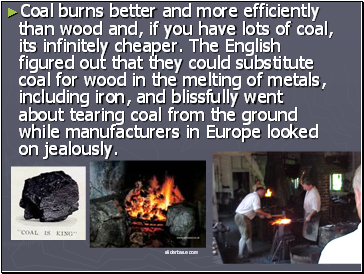 The English figured out that they could substitute coal for wood in the melting of metals, including iron, and blissfully went about tearing coal from the ground while manufacturers in Europe looked on jealously. 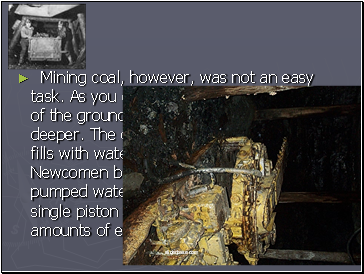 Mining coal, however, was not an easy task. As you drew more and more coal out of the ground, you had to mine deeper and deeper. The deeper the mine, the more it fills with water. In 1712, Thomas Newcomen built a simple steam engine that pumped water from the mines. It was a single piston engine, and so it used vast amounts of energy. Until a Scotsman named James Watt added a separate cooling chamber to the machine in 1763; this cooling chamber condensed the steam so the cylinder itself didn't have to be cooled. 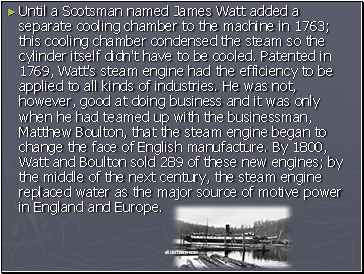 Patented in 1769, Watt's steam engine had the efficiency to be applied to all kinds of industries. He was not, however, good at doing business and it was only when he had teamed up with the businessman, Matthew Boulton, that the steam engine began to change the face of English manufacture. By 1800, Watt and Boulton sold 289 of these new engines; by the middle of the next century, the steam engine replaced water as the major source of motive power in England and Europe.